In the series of professional LCD displays from TVS, with the LP-12 we offer you a compact and professional monitor with a 30.5 cm 12 screen. Colours are brilliantly presented with a resolution of 800x600 pixels, a contrast rate of 2001 and brightness of 300 cd/m2. The LP12 professionally avoids user fatigue caused by flickering screens through a reaction time of 20/35 ms, while the viewing angle of 120 778 increases user efficiency. Configuring the monitor is especially easy with help of the i-touch auto-scaling function even without calibration experience, the user simply presses this functions button and then leaves any adapting to the device. With the control element located on the side, accidental changes to the configuration are avoided. The robust characteristics of the housing are perfectly maintained in the stable stand. You in commerce, in the office, or in production use it individually as a standard display, or as a console device with a maximum tilt of up to 45 778. The massive stand guarantees stability in any surrounding. Optionally we offer you diverse mounting options in order to place it via VESA mount directly on the wall, furniture, or devices, guaranteeing high flexibility to professionally react to different customer demands. Trendy colour versions in white and black round out the presentation. 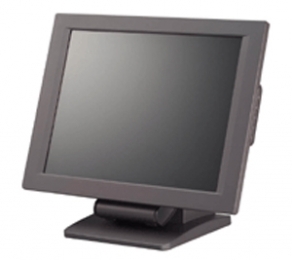 Optionally you also get the 30.5 cm 12 monitor from TVS with an especially robust and scratch-free glass surface - this non-reflective version gives you additional security for use in industrial surroundings and as a kiosk solutions. We also offer you the LP-12 with an integrated Elo Touchscreen. You operate the application directly via resistive touch technology, allowing them to completely forego additional entry devices. In order to integrate you payment transactions or incentive measures, the LP-12 has a magnetic stripe reader. Placed elegantly on the device with an almost invisible cable guide, the LCD thus becomes a central point at the POS station.